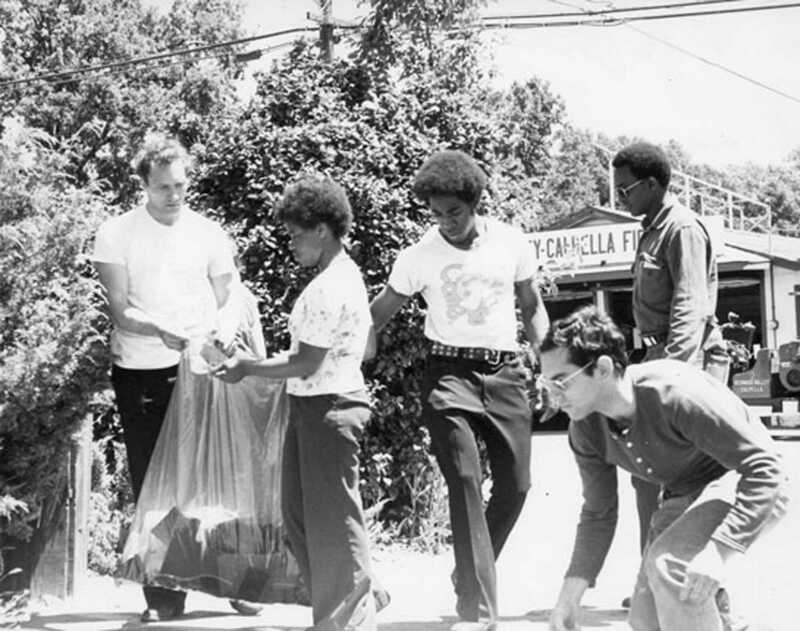 Peoples Temple members pick up trash off the street. From the Peoples Temple Collection. California Historical Society. In 1974, Jim Jones dispatched a few Peoples Temple members to rent more than 3,800 acres of jungle property in Guyana, a former British colony in South America where the population spoke English. Getting to the Jonestown Agricultural Project from the capital, Georgetown, involved 24 hours in rough ocean waters followed by 12 hours upriver to Port Kaituma. From there, travelers bounced over six miles on rutted roads to Jonestown. One stipulation of the lease was a requirement that one fifth of the land be cleared for cultivation. The first 35 to 50 Jonestown residents were primarily young men who spent their days cutting down trees and then dousing them with kerosene and setting them on fire. By 1977 there were sixty cottages on site, large kitchens and food storage areas, laundry rooms, an infirmary, and two schoolhouses, as well as an open air pavilion where meetings could be held. Jonestown housing settlements. 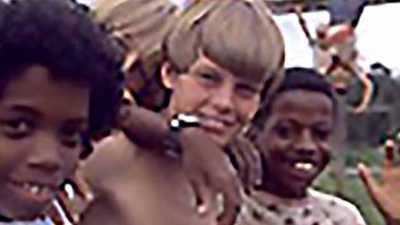 Jim Jones arrived in August 1977 with hundreds of others. Although the camp was well run for and by 50 people, suddenly housing almost a thousand residents strained the resources of the camp. Once there, Jones’ worst tendencies resumed unchecked. He confiscated medicines from every resident and kept himself alternately medicated on amphetamines or barbiturates. The public punishments and humiliations continued, as did the private sexual advances. Jones declared that all men (except himself) were homosexuals and tightened his control over who could associate with one another. Families were broken apart and asked to inform on each other. Hard physical labor occupied able bodies six days a week. The late night meetings continued, and occasionally escalated into “white nights” — all night sieges during which the entire population would huddle in the main pavilion listening as Jones railed against conspirators in the government, the media, and the relatives who wanted to destroy their community. Jones also controlled all information. Letters coming in or going out were censored; telephone calls were restricted or scripted (relatives in the United States remembered hearing Jones or other voices coaching their loved ones on what to say). There was nothing to contradict Jones’ version of the news: the Ku Klux Klan was marching through the streets of American cities; concentration camps were being erected for blacks and political dissidents; and the inevitability of nuclear war was nigh. Armed Peoples Temple guards patrolled the jungle around Jonestown, ostensibly to protect the residents but clearly threatening anyone who considered escape. In anticipation of an assault, Jones had his followers practice revolutionary suicide, drinking from vats of flavored water which he announced was poisoned. When they survived the “poison” the residents realized it was another test of their loyalty and that they had passed. Meanwhile, frantic relatives in a group called the Concerned Relatives were lobbying American authorities to investigate Peoples Temple and Jonestown and allow them to communicate directly with their loved ones. Peoples Temple defectors, among them Deborah Layton and Grace and Tim Stoen, told their stories to the American media, detailing the armed work camp and threats of mass suicide. 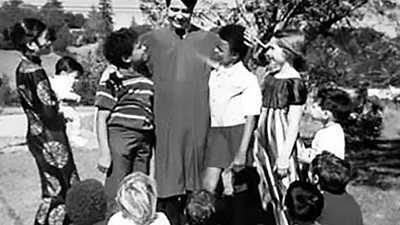 On November 7, 1978, U.S. Representative Leo Ryan of San Mateo, California, announced he would form a congressional delegation to investigate these stories. The population of Jonestown died on November 18, 1978. 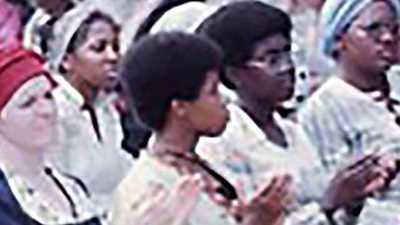 Peoples Temple welcomed people of every race and ethnicity. The racial integration became self-fulfilling at some point; the congregation itself became the draw.